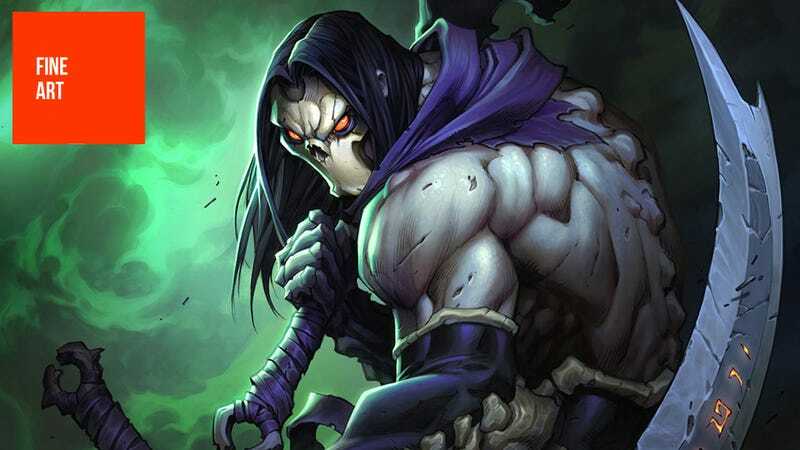 You could, if Hong Kong gangsters weren't your thing, call Darksiders II the biggest game release of the week. Probably the month, too. So now's probably as good a time as ever to look at some terrific concept art from the game. The environmental and weapon images below were done by artist Jonathan Kirtz, a freelancer who has also worked on games like the Warhammer 40K MMO, Warhammer Online and Kingdoms of Amalur: Reckoning. You can see more of Jonathan's work at his personal site. Meanwhile, all the character art you see (with the exception of the large Death "painting", which was done by Joe Mad and Kirtz) was the work of a team of artists led by James Brian Jones, Vigil's Studio Character Lead. You can see James' personal site here.